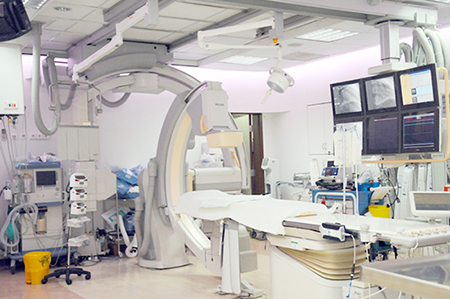 The Cardiac Catheterization (Cath) Lab caters to patients who require cardiac catheterization to diagnose and determine treatment of symptoms like chest pain, shortness of breath, or when a myocardial infarction or angina is present. The patient with any of these symptoms is evaluated by a cardiologist using methods such as an electrocardiogram (ECG) and a cardiac stress test to recommend Cardiac Cath utilizing a multidisciplinary team approach. 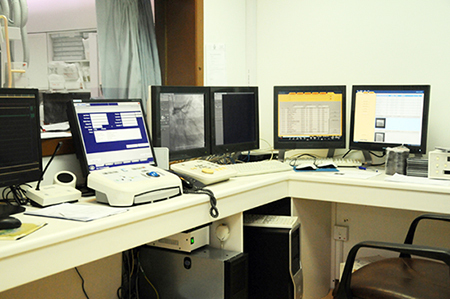 The Lab is equipped with X-ray angiographic equipment to carry out these procedures. Cardiac device implants like pacemakers and ICD and CRT implants.